Pacific Trading Cards, Inc., along with the American Hockey League® and the Professional Hockey Players Association, has announced that its first hockey card set featuring the stars and prospects of the AHL® will go on sale Wednesday, May 12. 2004 Pacific Prospects AHL® Edition Hockey will mark the first time in a decade that the stars of the AHL® will be featured in a nationally distributed hockey trading card set. The product will feature the top young prospects in hockey along with insert cards, autographs and game-worn jersey cards. "The AHL® has strong roots in many American and Canadian cities, and it is the premier developmental league in all sports. The AHL® not only has the top young hockey stars of tomorrow, but it is also rich with its own stars that have emerged in the league," said Jeffrey Morris, Pacifics VP of Marketing. "Both the AHL® and the PHPA were exceptional partners in getting this product put together, and we strongly believe that 2004 Pacific Prospects AHL® Edition Hockey will be one of the most relevant and collectible trading card products issued this year." 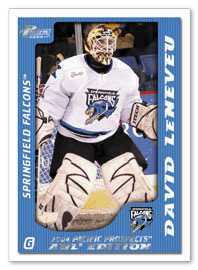 For many young stars like goalies David LeNeveu and Hannu Toivonen, 2004 Pacific Prospects AHL® Edition Hockey will mark the first time they have been featured on a nationally released trading card. Several players like Kari Lehtonen, Ryan Miller, Pascal Leclaire and Mattias Weinhandl are already household names among many hockey card collectors, and they will appear in the Pacific Prospects AHL® Edition Hockey set as well. There are also two insert sets featuring recent AHL® grads like Rick DiPietro, Jason Spezza, Trent Hunter, Jonathan Cheechoo, Michael Ryder, Andrew Raycroft and other top young stars. Crease Lightning is an eight-card goalie set with better than two cards per box, while Destined for Greatness features 10 top young offensive stars with an average of five cards per box. In addition to the 100-card base set, there are six AHL® All-Star Game-Worn Jersey cards, with one inserted in every 24-pack box. Players included are Wade Dubielewicz, Jeff Hamilton, Tomas Plekanec, Denis Shvidki, David LeNeveu and Matt Murley. There are also autographed cards featuring some of the AHLs® top goalies, including Lehtonen, Miller, Leclaire, LeNeveu, Dubielewicz and Ari Ahonen. Autographs are randomly inserted at an average of one every 49 packs. "We are excited about the release of the first 2004 Pacific Prospects AHL® Edition Hockey set and believe collectors will be very pleased," stated Dino Fazio, Director of Marketing, Licensing & Communications for the PHPA. "The potential of the top prospects included in the set, coupled with the quality of the inserts and the Pacific reputation combine to make this a great product." The AHL® continues to serve as the top development league for all 30 National Hockey League® teams. More than 80 percent of all players to compete in the NHL® this season have been AHL® graduates, and over 400 players have taken the ice in both leagues in 2003-04. 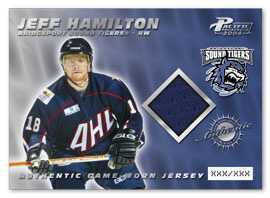 2004 Pacific Prospects AHL® Edition Hockey will be available wherever hockey cards are sold. They can also be ordered on line at www.theahl.com or at www.phpa.com.